David M. Campbell, MPA’79, was promoted to the position of city manager for the City of Longview, Wash.
Melvin L. Myers, MPA’77, is the author of Occupational Safety and Health Policy, published by the American Public Health Association in April 2015. Myers is an associate adjunct professsor, teaching environmental and occupational health policy at the Emory University Rollins School of Public Health in Atlanta, Ga., for over 22 years. He formally served in the U.S. Public Health Service for 30 years, with 10 years in the EPA and another 20 years with the Centers for Disease Control and Prevention. Since 2008, Kathryn Lux Brahm, BSPA’97, has served as the grants director for the Health and Hospital Corporation of Marion County, which includes the Marion County Health Department, Eskenazi Health, Midtown Community Mental Health Center, IEMS (Indianapolis Emergency Medical Services), and a long-term care division. Kristine L. Brannock, BSPA’86, is a registered nurse at Methodist Hospital in Indianapolis. Shaun T. Dingwerth, BSPA’89, is the executive director of the Richmond Art Museum in Richmond, Ind. He is the author of the book, The Richmond Group Artists, published in 2014 by Indiana University Press. Maria K. Heslin, BA’87, MA’93, MAAA’99, writes, “I have launched Business Boostcamp, a new organizational training program that addresses employee wellness and professional development.” For more information about the company, visit businessboostcamp.us. Michael Joseph Hudelson, BSPA’82, MPA’88, recently moved from director of sales for Intellectual Property Solutions at LexisNexis/Reedtech to director of IP Product Planning. Valerie L. Powell-Stafford, BSPA’86, was elected to serve on the Board of Governors of the American College of Healthcare Executives (ACHE). She will serve a three-year term representing more than 40,000 ACHE members. Powell-Stafford has served as chief operating officer of Blake Medical Center in Bradenton, Fla., since 2014. In March 2015, the Washington Business Journal honored Srikant K. Sastry, MPA’88, with a Minority Business Leader Award. He serves as the national managing principal of advisory services for the audit, tax, and advisory firm Grant Thornton. Sastry lives in Oakton, Va.
Becky A. Stapleton, MPA’86, was promoted to senior executive vice president and chief banking officer at S&T Bank headquartered in Indiana, Pa. In March 2015, the IU Richard M. Fairbanks School of Public Health Alumni Association honored William H. Thompson, BS’80, MS’83, JD’87, for his professional success and significant contributions to his community. Thompson, chairman of the law firm Hall, Render, Killian, Heath & Lyman, received the 2015 Distinguished Alumni Award. Kirk R. White, BSPA’84, has been promoted to the rank of colonel in the Indiana Army National Guard. He serves as operations and training officer for the 81st Troop Command, a unit that is responsible for defense support of civilian authorities during homeland emergencies. White, a 31-year IU administrative staff member, currently serves IU as assistant vice president for strategic partnerships and works to connect IU resources to the needs of Indiana’s business and defense communities. Richard L. Griffith, BS’97, was recently appointed chief of planning and development at the Richard L. Roudebush VA Medical Center on the IUPUI campus. He oversees strategic planning, capital investment, and marketing. Griffith is also a colonel in the U.S. Air Force Auxiliary and was recently recognized by the Indiana General Assembly for leading the Auxiliary in Indiana. He and his wife, Jamie, and their five children live in Indianapolis. Philippa Guthrie, MPA/JD’92, accepted an appointment by Mayor John Hamilton to serve the City of Bloomington as its new corporation counsel. Roger Hartley, BSPA’91, has been named dean of the University of Baltimore’s College of Public Affairs. Previously, he served as the primary administrator and policy leader for the MPA program in the Department of Political Science and Public Affairs at Western Carolina University. Prior to that, Hartley was interim director of the School of Public Administration and Policy and associate dean of the Eller College of Management at the University of Arizona. Hartley’s teaching and research positions prior to Western Carolina University and the University of Arizona include an assistant professorship at Roanoke College’s Department of Public Affairs, and stints as adjunct professor in the CUNY-John Jay College of Criminal Justice, and the CUNY-Baruch College Department of Political Science. Hartley has published dozens of articles, reports, conference papers, and review articles throughout his career on law and court systems, including the 2002 book Alternative Dispute Resolution in Civil Justice Systems. Catherine H. Hill, MPA’97, is the vice president, client and community relations director of PNC Financial Services in Northern Indiana. After moving his practice, Edward Louis Holloran III, BSPA’96, is now a partner at Quarles & Brady, LLP in Indianapolis. Erin M. McCauley, BA’96, MAAA’99, of Wake Forest, N.C., founded Chestnut & Vine, a day-of-wedding coordination company. Melanie (Reddy) Moran, MPA’96, is executive director of integrated communications at Vanderbilt University in Nashville, Tenn.
Dan E. Roach, BSPA’86, MPA’90, has accepted a public service faculty position with the Carl Vinson Institute of Government at the University of Georgia. Roach also serves as institute director for the Georgia Clerk’s Education Institute. Joab N. Schultheis, MPA’95, was recently appointed to the position of vice president, chief information officer at Atlas Van Lines. Sean M. Solis, BS’99, is a partner in the New York office of the law firm Dechert and practices in the firm’s finance group. He concentrates on structured products and other similar capital markets transactions, the formation and representation of credit funds, and capital markets regulation, with a focus on the risk retention regulations in both the EU and United States. He represents numerous asset managers, arrangers and issuers in structured financings and debt transactions, including institutional investors at all levels of the capital structure, with a focus on collateralized loan obligations (CLOs) and other complex financings as well as ongoing compliance issues regarding onshore and offshore investment funds, collateralized debt obligations, and other structured products. Prior to joining Dechert, Solis worked at a boutique hedge fund and a large international law firm. Sarah Anne Caldwell, BSPA’11, is the program manager with Wiley in their Global Education Services. Edwin Josue Castellanos, Ph.D.’00, has been appointed scientific advisor to the vice president of Guatemala on issues of environment and climate change. He was also appointed commissioner of climate change by the Ministry of Environment of Guatemala in preparation for the country’s participation in the climate change summit in Paris. Hannah Beth Cobine, BSPA‘09, recently accepted a position as M&A Integration Team Lead with ResCare, Inc. in Louisville, Ky.
Sarah Ditlinger, BSAM’15, is the membership coordinator at Enjoy the Arts, Cincinnati. Ryan Graf, MPA’10, serves as financial analyst at AE2S in Grand Forks, N.D. In July 2015, Katy E. Hall, MAAA’06, was appointed to the position of vice president for development at the Newberry Library in Chicago. In October, Katie D. Harvey, BA’09, MPA’15, of Indianapolis, joined Conner Prairie as director of individual giving. She will work to strengthen and enhance the museum’s individual giving program, help donors accomplish their philanthropic goals, and grow the number of people who support Conner Prairie financially. Harvey worked for IU as associate director of development at the School of Public and Environmental Affairs. In this role, she developed and executed a comprehensive annual giving and stewardship operational plan. In April 2015, Faren S. Jones, BGS’09, MPA’14, joined the staff of the Julian Center, Indianapolis’s largest provider of support and transitional services for those affected by domestic and sexual violence, as development and communications manager. She works directly on fundraising and communications campaigns related to the 40th anniversary of the Julian Center as well as for special events and annual projects. Prior to joining the Julian Center, Jones served in a variety of communications and donor development positions for Teachers’ Treasures, Partnership for Philanthropic Planning, and The Oaks Academy. She is the membership and recruitment chair for Giving Sum, a young professionals giving circle, and a member of YNPNindy, the Indianapolis chapter of Young Nonprofit Professionals Network. In January 2016, Stephanie Goodrid Lawson, MPA’08, joined the McKinney Family Foundation as the executive director. Joshua L. Martin, MPA’11, is the deputy director, government efficiency and financial planning, in the Indiana Office of Management and Budget. Weston T. Merrick, MPA’13, has accepted a job as an economic analyst at the Minnesota Department of Employment and Economic Development in Minneapolis. He lives in Minneapolis. John C. Miller, BA/BS’10, recently received a fellowship from the Women’s International Network of Utility Professionals to continue his education at the University of Oxford in the United Kingdom. Miller is a master of public policy candidate in the Blavatnik School of Government at the University of Oxford. Most recently, he was a senior analyst in the renewable energy and energy efficiency practice at Castalia, a cross-disciplinary consulting firm specializing in infrastructure development in emerging markets. After completing his graduate degree, Miller plans to return to the U.S. to continue to advise on energy policy and regulation that enables smart, low-carbon growth. In March 2015, Sarah E. Owens, BA/ Cert’12, joined Bose Public Affairs Group as an account executive with the government relations and strategic communications firm. She will serve clients in the areas of public relations, strategic communications, advocacy, social media strategy, and event planning. In November, Aashish G. Patel, BSPA’05, owner of Captain Jack’s Airboat Tours and Wooten’s Everglades Airboat Tours, was named to the Gulfshore Business “40 under 40” list, which recognizes young professionals and community leaders in Southwest Florida for their contributions to local businesses and the community. In addition to the ownership of Captain Jack’s Airboat Tours and Wooten’s Everglades Airboat Tours, Patel is also the owner of Everglades City Motel and America’s Best Value Inn, offers consulting services for a Hampton Inn in Lee County, and is the president and CEO of Madhav Group. For more information about Captain Jack’s Airboat Tours, visit CaptainJacksAirboatTours.com. Eric Spoonmore, BSPA’05, MPA’07, was elected by a special caucus on November 9, 2015, to fill the 4th District seat on the Monroe County Council in Monroe County, Ind. Rose E. Timpe, BSPA’11, MPA expected ’16, is working as the donor and alumni relations coordinator at Scecina Memorial High School in Indianapolis. Fundraising professional Karrie L. Zuccarello, BSPA’03, of Indianapolis, was named chief development officer at Conner Prairie Interactive History Park in Fishers, Ind. She joins the museum from IU’s School of Public and Environmental Affairs, where she was director of development. In her new role, Zuccarello will lead a team of seven charged with securing critical philanthropic support and developing partnerships with corporations, foundations, and individuals for Conner Prairie, which draws more than 360,000 visitors a year. The Bachelor comes back! 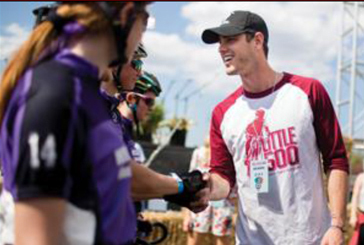 SPEA graduate Ben Higgins, BSPA’12, returned to Bloomington for the Little 500. Higgins, star of ABC’s hit reality TV series “The Bachelor,” served as grand marshal of both the women’s and men’s races. Higgins is an account manager for Talisys, a financial services software firm based in Golden, Colo. He was accompanied by his now-fiancée Lauren Bushnell, a flight attendant from Marina del Rey, Calif.